Written By: Joyce Zborower, M.A. Are you or any of your loved ones among the above groups? If so, then you/they are in danger of suffering the effects of a serious vitamin B12 deficiency. These "effects" can take various forms such as anemia where you feel tired all the time and that your strength has absolutely vanished to real neurological damage as in newborn babies of strict vegan mothers to mental disorders in the elderly mimicking Alzheimer’s disease. Without proper testing, even doctors can be fooled into providing inaccurate diagnoses. 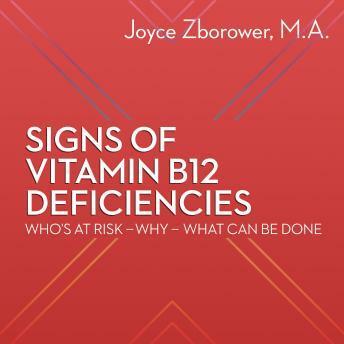 Signs of Vitamin B12 Deficiencies is written in straight-forward, easy-to-understand language so anyone with an interest in the subject matter can quickly grasp the concepts. However, self-diagnosis and treatment is highly discouraged.